"Aspen Bay......... Our unique super-refined, food-grade all-natural soy wax blend absorbs more fragrance oil than any other natural candle wax available. Our special formulation burns clean and strong, and can last up to twice as long as normal candles. Our fragrances are designed in-house with the assistance of the finest perfumers from all around the world, and we use recycled materials wherever possible in the production of our products. And because it matters to us, we hand-pour all of our products here in the USA in our factory in Starkville, Mississippi. 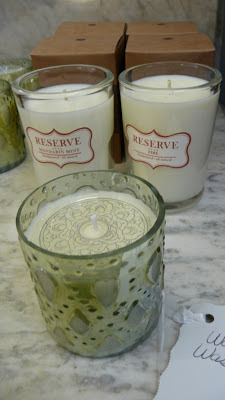 The result is a line of premium candles with quality you can see and most importantly smell." Walnut table is for sale, too!